Yellowtail kingfish, the premium member of this group, has a medium to strong, distinct and pleasing flavour. With few bones and a good recovery rate, it is adaptable to all kinds of appetising approaches. It is often sold as cutlets or steaks but can be cooked whole.The most suitable methods of preparation for yellowtail kingfish are grilling, barbecuing, baking and deep and shallow frying, but it is also superb for making sashimi. Wrapping in foil helps retain moisture when barbecuing and baking.Because of its flavour and colour, yellowtail kingfish marries well with other finfish, such as tuna, either cooked or served raw.Grilled cutlets or steaks are great for presentation and suit Cajun-style cookery or the flavours of lemon and soy, ginger or chilli chilli jam marries especially well.Because yellowtail kingfish can be a little dry, the use of a good citrus and garlic marinade prior to cooking will help to retain moisture during the cooking process.The other species listed here can be treated similarly and are ideal cubed and placed on skewers alternately with onion, cherry tomato and capsicum. Price These species are medium-priced finfish. 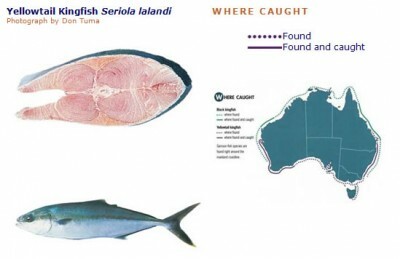 Yellowtail kingfish is usually higher-priced than black kingfish or samson fish. As a flavoursome finfish, yellowtail kingfish needs wines that are both flavoursome and light. Try an unwooded chardonnay or colombard.With the Cajun-style or chilli flavour-ings, a traminer riesling blend will complement. Data presented are for yellowtail kingfish. Kingfish are more flavoursome, moist and tender when smaller and taken from colder waters.